One of Tasmanian football’s true nomads, Garth Smith was a notoriously tough, exceptionally skilful and versatile player, featuring in a total of five league and two state premierships during his celebrated 15-season career. Born in 1938, Garth Smith made his senior debut for Ulverstone aged just 15 in 1953. Unfortunately he was only able to play one game for the Robins that season, as Devonport High School had instituted a rule that its students – which included Smith – were not permitted to play senior football. The school relaxed the rule slightly in 1955, allowing Smith to be a member of that season’s famous Ulverstone team under Arthur Hodgson that became the first NWFU side to claim the state premiership; named at full-forward for the match against Longford, Smith kicked two goals as the Robins emerged 41-point victors. The following season, Smith relocated to Hobart to study a physical education course at the University of Tasmania, and spent the season playing senior football with Hobart in the TANFL. Smith returned to Ulverstone the following year – playing in a second premiership with the Robins – before he was again on the move, this time following teammate and coastal legend ‘Paddy’ Martin to Burnie at the start of 1958. In two seasons at West Park, Smith established himself as one of coastal football’s brightest young stars, playing a key role in back-to-back Tigers premiership teams and featuring in the first of his 20+ representative games for the NWFU. In 1960, Smith made his first foray into coaching when he returned to Ulverstone as captain-coach, aged just 22. He spent two reasonably successful seasons in charge of the Robins (guiding the club to successive preliminary final finishes) before moving to his fourth club in eight years in 1962, embarking on a two-year stint as captain-coach of Latrobe, inheriting the role from the iconic Darrel Baldock following the latter’s move to St. Kilda. In 1964, Smith accepted a role as playing assistant coach with TANFL side Clarence. Unfortunately, Smith’s former TANFL club Hobart refused to give Smith the clearance necessary for him to play with the Roos; as a result Smith opted to stand out of football for the 1964 season, effectively becoming a free agent. By this time Smith had been transferred to New Norfolk in his employment, and so in 1965 he joined New Norfolk under the great Trevor Leo. Smith went on to become one of the key members of the great Eagles sides of the late 1960s, playing in the club’s maiden TANFL and state premiership triumphs in 1968. Along with his success at club level, Smith was also one of the pre-eminent representative players of his time. 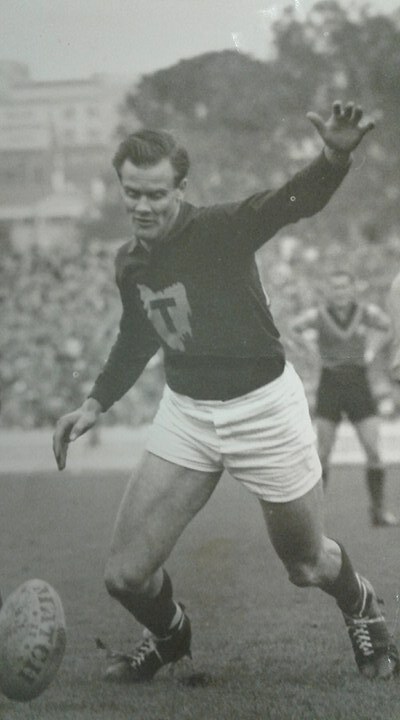 A regular member of intrastate sides for much of his career, he also appeared 16 times for Tasmania, and was a member of two National Carnival teams in 1961 and 1966. It’s something of a surprise that in 15 seasons he never won a club Best and Fairest award, however this fact does nothing to lessen the magnificent record he left on the Tasmanian football landscape, one he finally departed at the end of 1969 after more than 300 senior games. Post-career, Smith briefly dabbled in administration, serving stints as president of both the Devonport Football Club and the NTFL. He also served on the Ulverstone Football Club committee, at a time when three of his sons were playing with the club. His contribution to the game has been acknowledged and honoured many times, most notably with his selection in the official Greatest Teams of both Ulverstone and New Norfolk.